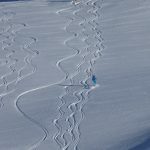 Your options ski touring and skiing off piste in Tignes and the Espace Killy are endless. Time, weather,your fitness level and ski ability are the only factors that will restrict your options. 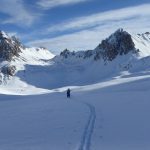 Ski touring the 3 Col’s is a quiet and friendly estimated around 6 hour ski tour with some stunning views. 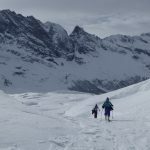 It is such a peaceful and gentle ski tour with up to to 3 hours of touring uphill so you have to have a good fitness level but it is gentle so you don’t need to be too skill full at ski touring as kick turns are not needed. 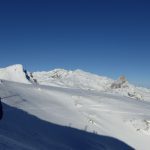 The start of the tour is very accessible from the Grattaleu Chairlift or the Col Du Palet drag in Val Claret in Tignes where you traverse into the Col Du Palet. You then ski untracked snow into the bowl passing the Col Du Palet refuge which on your right hand side. If you keep right you then makes some great off piste turns on slight steeper terrain towards the Lac Du Grattaleu. You then put on your skins once you reach the Plan de Janin. Follow the river floor passing the Chalet des Aimes you then cross over the river and climb up to the Col Du Grassez. This section will take you around 1hr and 10mins. This spot is a great lunch spot with the view of the Grand Caisse in the background. 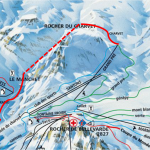 There are two main options for the ski down from the col. You can follow the itinerary route and ski down more of a gentle pitch in direction of the Chalet du Grand Plan or depending on snow conditions you can keep left close to the Aiguille Noire for more of a steeper off piste route. 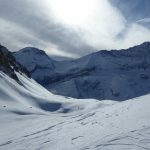 Both options will lead you to the valley floor where you then ski tour up to the Col De La Croix des Fretes then onto the Col Du Palet which can take up to 1hr 40 mins depending on your energy levels. Once you reach the Col Du Palet it is then a short traverse back onto the piste and then back to Val Claret. A perfect tour for a good level of fitness. 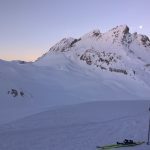 The Refuge Col Du Palet is a great base camp or lunch spot for ski touring and skiing off piste in the Vanoise National Park in Tignes, which is very accessible from the Grattaleu chairflift and the Col Du Palet drag lift. 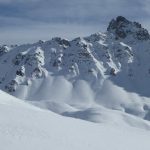 You would need to hire a guide or instructor to take full advantage of the area as the off piste and ski touring routes to find fresh powder are endless. 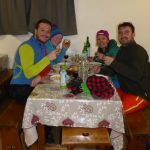 After an amazing ski tour summiting to the Col Du Grassaz and skiing fresh powder tracks on our return we arrived to the refuge happy and hungry and were welcomed by Nicolas who is the guardian of the refuge. 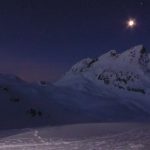 Nicolas has been the guardian for four summers in the Col Du Palet and has worked four summers in the Refuge De Leisse which is close to the Grande Motte glacier. This winter is his first winter in the Refuge Du Palet which is open Tuesday to Friday every week from the 23rd Dec 2014 to 24th of April 2015. One nights accommodation with breakfast and a delicious geerous three course dinner is very reasonable at €44.50 per head. 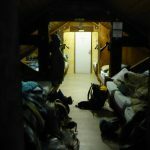 The refuge sleeps 15 people in the winter which is one large dormitory. Duvets and blankets are provided, however you must bring a sleeping bag liner or you can rent one for €3.50. The rules of the refuge is to take away your own rubbish. The prices for drinks inside the refuge are reasonable with a glass of red wine starting at €3 and a beer at €4. 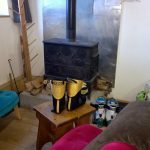 You can bring your own drinks and food to the refuge but that would mean that you would have to ski tour with your supplies all day. 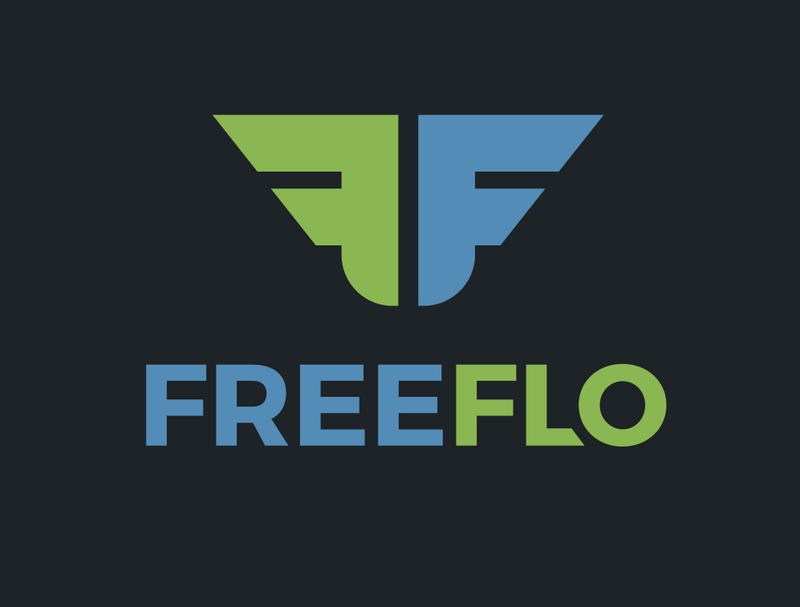 Don’t forget to bring some cash as you can’t pay with credit card in the refuge. Morning view from the refuge. Before dinner at 7pm we relaxed next to the wood burner stove discussing our adventures and looking at our photos of the day with an aperitif from the house which was made by Nicolas’s father. It was a perfect way to relax after a great day ski touring and skiing off piste. Pressed du pin which tasted very much like a sweet almond cognac. The first course was spilt pea soup which was accompanied with a slice of Tomme cheese and bread. Nicolas’s grandma Fi Fi’s slow cooked hot pot then followed which consisted potatoes,prunes and bacon which was a winter warmer after spending the day on the mountain. We were then spoilt with homemade chocolate fondant before getting an early night for the next day adventure. Breakfast was continental with homemade jam and a hot drink of your choice. Which was perfect before setting off to ski tour to the Col De Sachette then dropping off-piste into the Sache and ending up in Tignes 1800. For further information about the refuge see http://www.vanoise-refugedupalet.com. 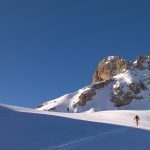 The Tignes off-piste skiing route Tour De Charvet is one of those classic Espace Killy off piste routes where you can really enjoy the skiing in the backcountry with a small calculated avalanche risk. You start the route in Tignes descending of the back of the Grande Pre chairlift and you end up in the beautiful town of Val D’Isere. After a quick check of our transceivers on the electronic device on the post at the top of the chair lift, Susie, Rich and myself nipped under the rope at the top of Grand Pre to start our off piste route. Knowing the route very well, I anticipated the first pitch to be affected by the wind with little snow so there was no great surprise when I was trying to keep balance on windblown snow with variable depths of crust. 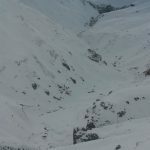 Being able to see the ridge wind scoured we kept our height and traversed to the right where we choose to ski down one of the gullies to the river Ruisseau which was gushing with water. Normally the river is frozen so you can ski across it, but not this time! Today with roaring temperatures and unusual lack of snow I choose the safer option of keeping left of the river and using the few ski tracks in front of me to navigate between the rocks and to join the footpath. With the knowledge that the Manchet chair lift was close (normally your escape route out of the area) we kept to the footpath keeping our eyes peeled for any avalanche danger above. We then cruised through the valley floor to the restuarant Clochetons which was a fine coffee stop before winding through the sleepy back streets of Val D’Isere to the famous Les Olympiques cable car. The Arcteryx Norvan VT trail shoe is the number one choice for Patagonia.